Movies have always inspired me. One of my all time favorite movies about teaching is Dead Poets Society. This is one of those movies that makes you get out a pen and paper so you can begin planning new ways to improve your craft. How could I teach this better? Should I tweak that a little? The conformity scene (shown above) is thought provoking on different levels. How many times have I expected conformity with my students? Granted, a certain amount of conformity is needed when you manage a group of children. Students need to be quiet during a lesson so everyone can hear. As a general rule, the needs of the group take priority of the needs of the individual. But, are there ways I could allow my students to exercise their individuality more? We are told we need to differentiate, could this somehow be related? You’ve probably seen the graphic below on Pinterest. 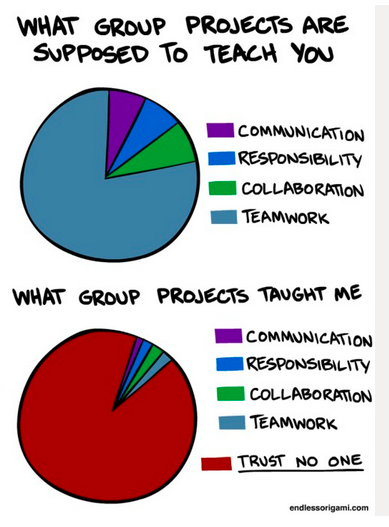 Many of my professors in grad schools assigned group projects. Many times these projects were 25% of our grade or more. That is fine if everyone in your group has the same work ethic as you. It can be very frustrating when you have a group member who is lackadaisical. Being a grad student made me appreciate what my students must have felt when I assigned group projects in the past. The wheels began spinning in my head. If I’m supposed to differentiate, does that include personalities and learning styles, too? I personally prefer to work by myself or with one partner. Even if I am put in a group of highly motivated learners, I prefer not to work in a large group. It’s simply a matter of preference. Do I have students who work better by themselves or with a partner? Would it be wrong to assign a project and let students choose whether they worked individually, with a partner, or in a small group? What are your thoughts? 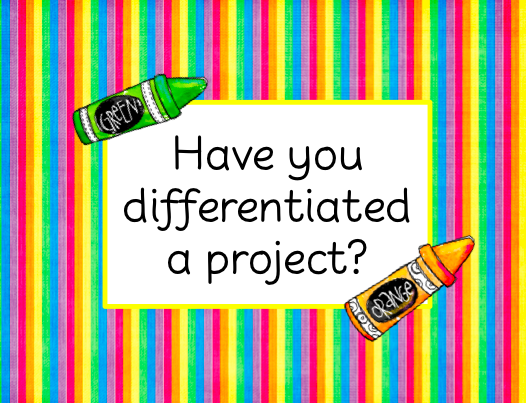 Have you differentiated your projects? Awesome question!! In the Conscious Discipline book I'm reading, there's research that says that choice actually fires a chemical in the brain that primes kids for learning. I think it's totally appropriate to give them a choice. Michelle, I love the post (of course) and a great little freebie.